It has been a while since I had been to Jaipur City so, there is a lot I couldn’t remember. Of course, that was bound to happen because the last time I visited this place, I was in just 4th class (a big nerd back then too!). So, when our plan to visit Chopta in Uttarakhand got interrupted, Jaipur seemed like a good place to relive some childhood memories. Needless to say, I was really glad that we decided to visit Jaipur because it was certainly more beautiful and mesmerizing than the pictures I have seen so far. Personally, I am more of a fan of beaches and historical places. This is why Jaipur was the ideal place for me to experience a little culture and look at the gorgeous historical architectures that are spread all around the city. You can also plan a Rajasthan trip by including Udaipur, Ajmer, etc. to make it long and fun. I truly enjoyed a lot in Jaipur and would definitely love to visit again. Here is a guide to help you plan your own itinerary when visiting this place. Jaipur, aka Pink City, is one of the most culturally and historically rich cities of India. This gorgeous city was founded by Maharaja Sawai Singh in 1727 and is one of the largest city in Rajasthan as well as being its capital. Here, you will observe numerous forts and palaces which are built out of a pink stone, hence the name, which adds more charm to this city. The grand avenues, bustling bazaars, and magnificent forts and palaces make this one of the most aesthetically pleasing cities of India. Trust me, you will fall in love with Jaipur’s grandness and timeless architecture. The energetic and colorful markets will beckon you to buy the beautiful Rajasthani fabric, shoes, jewelry, and so on. Jaipur is one of the most popular cities in North India and has a lot to offer, in terms of both sightseeing and historical knowledge. So, if you are history or cultural buff or if you just have a general love for photography then this place should definitely be on your itinerary. Jaipur is one of the main cities in Rajasthan so it is well-connected to other major cities in India like Delhi, Ahmedabad, Agra, Mumbai, and so on. Every day, millions of people travel to and from Jaipur from all over India. You have all kinds of public transportation options along with air, rail, and road. Here are a few ways in which you can reach this beautiful city. Jaipur Internation Airport is located in Sanganer which is 7 – 10 km away from the Jaipur city. This airport connects the Jaipur city to all the other major cities of India like Delhi, Hyderabad, Kolkata, Goa, Jodhpur, Mumbai, Bangalore Ahmedabad, Pune, etc. You also get International flights to places like Muscat, Dubai, Singapore, etc. from this airport which makes it convenient for foreign travelers as well. From the airport, you can take a taxi, auto or a bus to reach the Jaipur city. There are numerous trains connecting Jaipur to cities all over India via Indian Railways. You will get multiple trains to Delhi, Udaipur, Jodhpur, Ajmer, Jammu, Bikaner, Pathankot, Kolkata, Bhopal, Kanpur, and so on in a day. You can also take long-distance trains from Bangalore, Chennai, Pune, Kochi, Goa, Mangalore, etc. There are three railway stations in Jaipur: Jaipur junction, Gandhinagar, and Durgapur. All trains stop at the Jaipur junction railway station while a few local trains stop at Gandhinagar and Durgapur as well. If you are traveling from Delhi, then you can book a Second Sitting (2S) seat for yourself which will cost about 135 – 150 INR. I, personally, took a General ticket which cost 60 INR per person and the train took around 6-7 hours to reach. Apart from rail and air, you also have a good road connectivity to Jaipur so if you have your own car then you can do a road trip to this place too. However, if you are traveling alone or are on a budget trip then you will also get RSRTC buses to reach Jaipur city. There are several RSRTC and private buses connecting numerous places in Rajasthan, Delhi, Gujarat, Madhya Pradesh, and Haryana. You will find both non-AC and Volvo buses heading towards Jaipur. There are also bus connections to Mumbai, Ahmedabad, Vadodara, Agra, etc. so you won’t face many issues. From Delhi, you can get a bus from Dhaula Kuan or the Bikaner House on Pandara road. A non-AC bus will cost you somewhere between 250 – 500 INR whereas a Volvo or an A.C bus will cost about 500 – 900 INR. So she took a deep breath, Plastered a smile on her face, And got ready to fight. Because she knew that if she wished her fairytale story to come true, She will have to fight, She knew that nothing comes on a silver platter, And so, she went for what she wants. Not knowing if she will get it or not, Only knowing that if she didn't try then she might as well forfeit the war. But she chose, she chose to fight. Until the very end. One of the best things about Jaipur is that you would find numerous budget-friendly traveling options to explore the Jaipur city. You have local city buses, e-rickshaws, Uber, etc. which are usually cheap and connect almost all the places in Jaipur. One of the cheapest and convenient options to explore the Jaipur city is by taking the local city buses. You can take these buses to reach Amer Fort, Hawa Mahal, City Palace, Jal Mahal, etc. and it wouldn’t cost you more than 10-20 INR for a journey. There are frequent buses on all the routes so it is easy to catch a bus. You can simply check the bus number for a route on your Google map or you can ask a local person to guide you. After buses, the next cheap and convenient transportation option is an E-Rickshaw. You can get a shared E-rickshaw or a private one to cover a distance of 5 – 10 km. For a 5 km distance, you will be charged 20-25 INR per person on a sharing basis, depending on your bargaining skills. Although E-rickshaws are cheap, they take a lot of time to reach your destination. So, if you are in a hurry then catching an E-rickshaw might not be the best option. There are also auto-rickshaws here which you can take if you want to reach a place quickly. However, they will be costly and will often quote a price of 100 for a 5 km distance. You also have private taxis, Uber, etc. available here but the price for them is again high. Also, you might have to wait a long time before you get an Uber here so it would be better to choose another transportation mode. Although Jaipur city is not as well connected via metro lines as Delhi, you can still use it for a few places. There are currently two metro lines open, connecting 11 stations on the North-South corridor and 20 stations on the East-West Corridor. The North-South Corridor has Mansarovar and Badi Chaupar as the end stops. And, the East-West Corridor has Sitapura and Ambabari as the end metro stations. The minimum fare of traveling in the Jaipur metro is 5 INR while the maximum fare is 20 INR. You can find more information about Jaipur metro here. Jaipur experiences a lot of humidity and heat which is why one has to be careful when planning a visit to this place. Here is a detailed description of what you will find here in each season to help you plan your trip better. Unsurprisingly, the best time to visit Jaipur is in winter from October to February. During this time, the climate is pleasant during the daytime although the nights are slightly cold. However, it is bearable with a thin jacket. The monsoon season lasts in Jaipur from July to September but this area doesn’t receive high rainfall. During the month of September, the temperature is cooler and there is little but manageable humidity. So, if you want to visit Jaipur before the crowd starts coming in then August – September would be a good time to visit. Most of the places are open and you can enjoy a quiet time in this beautiful city. Also, you can celebrate the popular Teej or Ganesh Chaturthi festival in Jaipur during this time. Probably one of the worst time to visit Jaipur is the summer season which lasts from April to June. The summer months are hot and dry and it is almost impossible to go sightseeing during the daytime. If you do decide to visit Jaipur during this time, make sure that you keep yourself adequately hydrated and eat lots of fruits for energy. As mentioned before, Jaipur is filled with amazing architectural gems and historical monuments which makes this a fascinating place to visit. Here are a few places in Jaipur city that you must visit when exploring this stunning Rajasthani city. 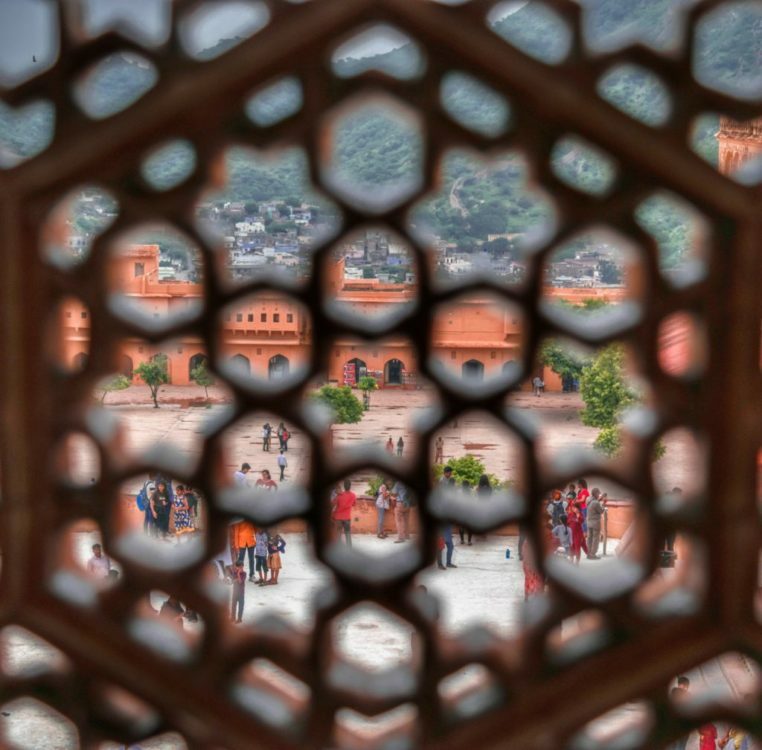 One of the most interesting and fascinating places in Jaipur City, City Palace is filled with courtyards, gardens, and beautiful architecture. This is where the royal family of Jaipur still resides and one can easily see that it was one of the richest families in India, at a time. Now, the royal family lives in the Chandra Mahal which is only accessible to tourists who pay an entry fee of 2500 INR. If you aren’t interested in paying such a hefty amount then you can go for another ticket which will give you access to the museums and the palace grounds. And, if you are interested in watching the light and sound show at night and want to visit the museum during nighttime, then you have to take a separate ticket for that. Opening Timings: 9:00 a.m. to 5:00 p.m. for normal sightseeing and 7:00 p.m. to 10:00 p.m. for night viewing. One of the most recognized buildings in the Jaipur City, the interesting design of Hawa Mahal makes it one of the top spots to visit in Jaipur. It has 5 floors consisting of several small windows which let the wind pass through, making this palace windy and giving it its name. The windows are kept shut now so you won’t feel the strong winds while visiting the palace anymore. It is said that this intricate facade was built so that the women inside the palace could observe the streets without being seen. Although visiting the Hawa Mahal won’t offer you a good view which is why it is a good idea to watch this place from the opposite rooftop cafes. You can watch the Hawa Mahal from the opposite side, late at night as well and don’t need to pay any fee for the same. Opening Timings: 9:00 a.m. to 4.30 p.m.
Another popular destination in Jaipur City that should be on your itinerary is the Nahargarh Fort. This is where many scenes from Rang De Basanti were shot too so you might recognize a few spots here. 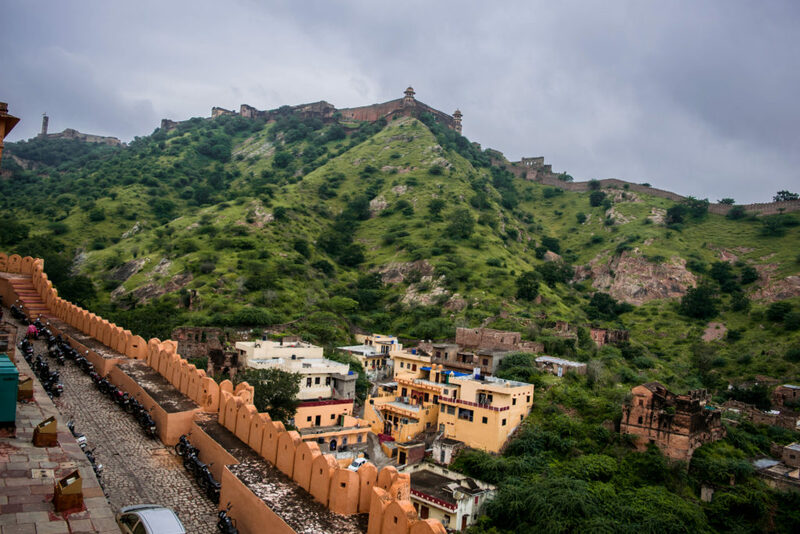 Built in 1734, this fort acts a defensive structure and is also named Tiger Fort as it is perched on top of the bumpy Aravali Hills. Although there isn’t much to see here like the Amer Fort, this is a great place to take in the panoramic view of the Jaipur City. And, you get to witness some amazing sunsets from this fort as well. Opening Timings: 8:30 a.m. to 6.30 p.m.
An old, famous museum in Jaipur City, Albert Hall Museum is India’s oldest art and culture exploration center. It has an amazing Indo-Saracenic architecture and is often the main hub for several festivals, concerts, rallies, etc. in Jaipur. Here, you would find a wide collection of portraits, paintings, woodcarvings, art, and crafts, from all over India. This museum is particularly famous for an Egyptian mummy as well but you aren’t allowed to take photographs. Albert Hall Museum looks particularly magical at night time and is open for night viewing now. Opening Timings: 10:00 a.m. to 5:00 p.m. for normal sightseeing and 7:00 p.m. to 10:00 p.m. for night viewing. An important pilgrimage site for Hindus, Galta Ji or the Monkey Temple is nestled between the Aravali Hills. Although reaching here is a bit of a task, it is completely worth the effort. This temple has 7 sacred kunds and has a unique architecture which makes it a stunning sight for any visitor. It is also said that Tulsidas spent some time here to write the famous Ramcharitamanas. You will also find shrines dedicated to Lord Hanuman, Lord Rama, Lord Vishnu, Brahma, etc. placed here. Known as the Ninth Gate of Jaipur City, Patrika Gate helps the city abide by the principles of Vastu Shastra and form a balance in the city. Jaipur was constructed on the teachings of Vastu Shastra and has been planned on the number 9. This gate is one of the entrances to the Jawahar Circle Park which is Asia’s biggest circular park on a traffic signal. 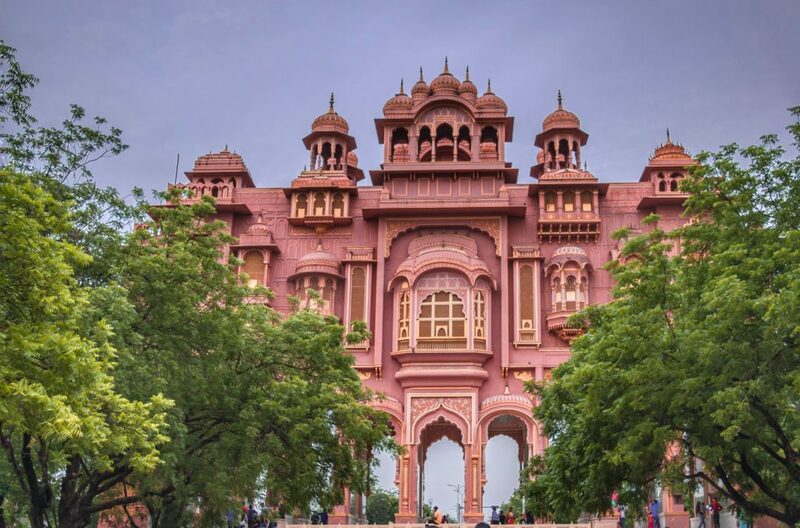 Patrika Gate is beautifully designed and is a great way to introduce yourself to the traditional side of Jaipur. It has a bright and intricate design where all the bright colors used to add a magical effect to this place. Also, the symmetrical architecture of this gate makes it a popular photography spot for everyone who visits this park. Although you might feel that there is nothing special about the Jantar Mantar of Jaipur City, this is actually untrue. This is one of the largest observatories in the world which was built by Maharaj Jai Singh II. He had a deep interest in astronomy, architecture, etc. which is why he built the largest observatory in India. You will find the largest sundial of the world in this observatory along with other devices which were used to measure time and observe the sky. If you love learning about space and time then this is a place that you must visit in Jaipur. Opening Timings: 9:00 a.m. – 4.30 p.m.
Popularly known as the Amber Fort, this fort lies in Amer which is 11 km away from the Jaipur City. 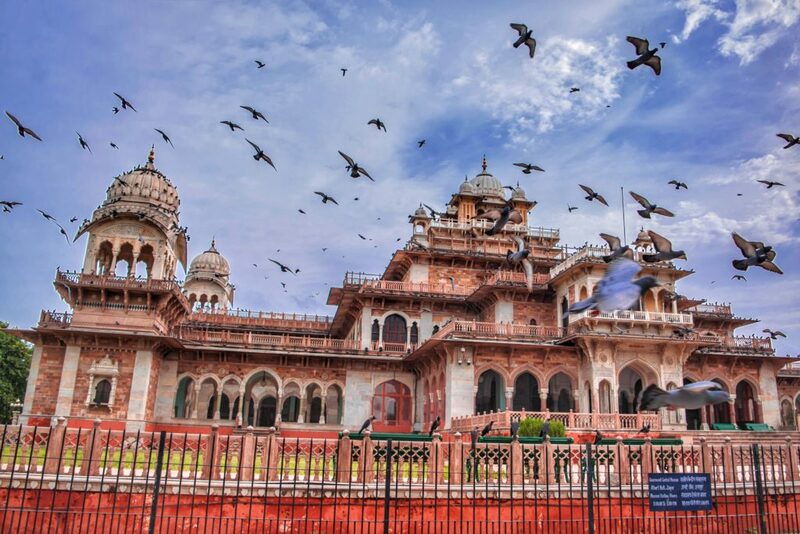 This fort was built by Raja Mansingh in 1952 and displays a perfect blend of Indian and Mughal architecture. There are 4 entrances to this fort, the main entrance facing the east and one can observe daily elephant rides through this door. There are several gorgeous palaces, courtyards, halls, gardens, etc. inside this fort. Inside this fort, you will find the Sheesh Mahal, Ganesh Pol, Chand Pol, etc. which are beautifully designed using the vegetable colors. As a result, this place is a paradise for history loves and photography enthusiasts as you can take some truly enchanting pictures here, especially when it is not crowded. Opening Timings: 9:00 a.m. to 5:30 p.m. for normal sightseeing and 7:00 p.m. to 10 p.m. for the night show. Situated around 5 km from the Jaipur City center, Jal Mahal lies in the Mansagar Lake and is an architectural delight of Jaipur. This is a summer treat, built by Maharaja Jai Singh II and has beautiful hallways and baghs inside. However, you cannot visit this palace as it is closed off to the public. You can simply come to watch this palace from afar during the morning or the evening time. 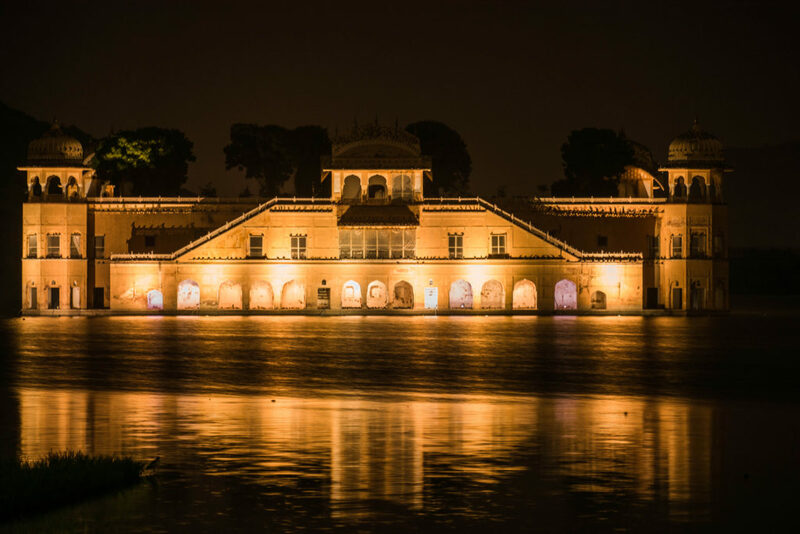 During the evening time, the Mahal is lit up so it looks mesmerizing and one can enjoy an evening stroll beside the lake. Built in 1726, Jaigarh is the largest fort in Jaipur City and has a brilliant structuring from a military standpoint as well. You will observe magnificent gateways and watchtowers here and can also find the world’s largest cannon on wheels over here. 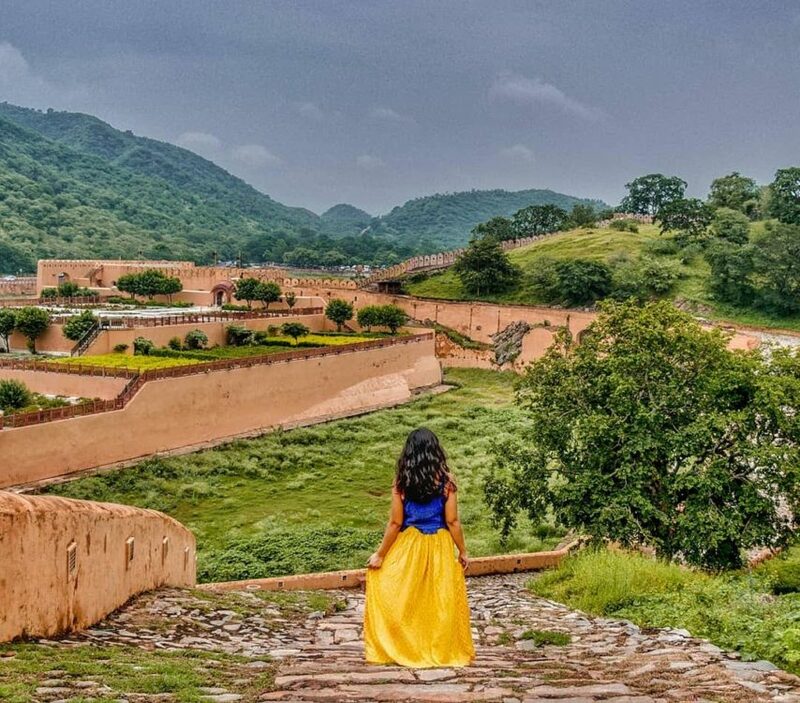 This fort has been properly preserved due to its military structures and actually resembles a real fortress, unlike the Amer Fort. It is spread over a distance of 3 km and is the major symbol of Rajput’s military prowess. Any visit to Jaipur must include a few hours at Jaigarh Fort to learn more about the history and culture of this beautiful city. Situated on top of the uneven Aravali Hills, Nahargarh Fort offers you a spectacular view of the city. But it is the sunset from here which is likely to blow your mind. So, when in Jaipur City, make sure that you head to this magnificent fort in the evening to watch a gorgeous sunset from the palace walls. You can also relax in the government-operated cafe here and can watch the entire fort get lit up at night, making it look even more enchanting. Hawa Mahal is one of the most popular spots in Jaipur City and you would see countless people surrounding this area at all times. This is why it is often a good idea to observe this beautiful architecture from the opposite rooftop cafes like The Tattoo Cafe, Wind View Cafe, etc. You will also be able to take the most amazing pictures from the opposite end and can look at this gorgeous Wind Palace for as long as you want, without having to fight the hordes of tourist all the time. If you are looking for something to eat as well, then I would suggest you try The Tattoo Cafe here. One of my favorite memories of Jaipur City was waiting for the Hawa Mahal to get lit up in the evening. You can sit and chill in the cafes opposite to Hawa Mahal and unwind for some time while the sky turns a brilliant shade of pink as the sun sets. And after a few minutes of the sunset, you will observe different lights being turned on in the Hawa Mahal which gives it a downright ethereal feel. But, the best part is when all the bright lights are immediately turned on and Hawa Mahal sits opposite to you in a golden spotlight, giving it a magical touch. This is undoubtedly one of the most beautiful things to observe in the Jaipur City and if you are lucky, then you might also see a full moon rising behind the Hawa Mahal. I am not kidding when I say that Jaipur has the most amazing and royal places for you to take a picture in. The magnificent palaces, forts, royal doors, etc. make for a perfect backdrop, giving you the Instagram-worthy pictures that you always wanted. So, make the most of your time here and get clicked at beautiful, quaint spots to show off to your friends or family later. You will definitely feel like a King/Queen here if you just have the right outfit to match your surrounding. An architectural gem of Jaipur City, the Albert Hall Museum looks magnificent during the daytime but it turns even magical at the night. This place was modeled on the Victoria and Albert Museum in London but has a touch of Neo-gothic and Islamic architecture. This famous museum has a lot of interesting artifacts, paintings, sculptures, etc. which you can observe in the daytime. But, what truly sets this place apart is the night illumination when this museum is adorned in beautiful and bright colors of pink, blue, etc. Trust me, this is a sight to cherish so don’t miss out on seeing this amazing museum lit up at night. Jaipur is popular for its street food and delicious Rajasthani cuisine which includes dishes like Mawa Kachori, Ghewar, Pyaaz ki Kachori, and so on. 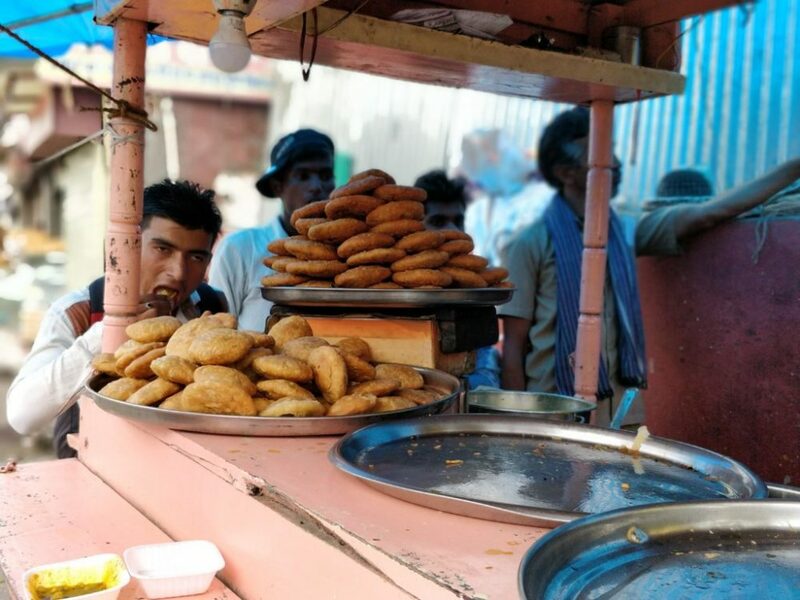 Here, in particular, you will find Pyaaz ki Kachori at every street stall and restaurant so, it is a must-try dish when visiting the Jaipur City. If you want to taste some mind-blowing Pyaaz ki Kachori then make sure that you try it at the Rawat Mishthan Bhandar. You will get it here for 30-40 INR and it will definitely leave you craving for more. Let’s face it. A trip to Rajasthan without tasting the delectable Dal Baati Churma is a trip incomplete. 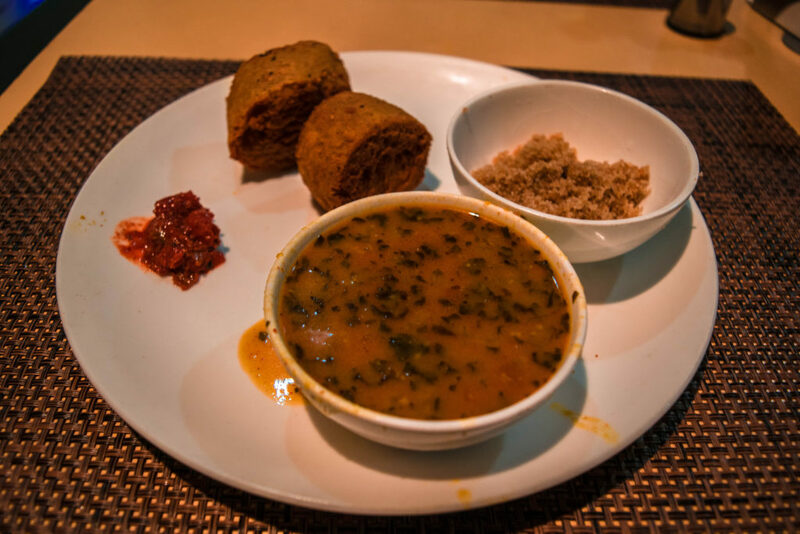 Dal Baati Churma is one of the exotic Rajasthani dishes which will really make your mouth water and will make you fall in love with the Rajasthani cuisine. So, make sure that you do try this delicacy when visiting Jaipur. One of the best things that you can do in Jaipur City is to taste the delicious street food which is both cheap and easily available. You will find numerous restaurants, street stalls, etc. which serve authentic Rajasthani dishes which will make your mouth water instantly. If you are looking for cheap and yummy breakfast then make sure that you check out the street stalls. they would serve Kachoris, Puri Sabji, Chole Bhature, etc. for just 20 – 30 INR. This would easily keep your tummy full for the next 2-3 hours at least. You will also find a few stalls serving Poha which will cost 20 INR and will be utterly delicious. 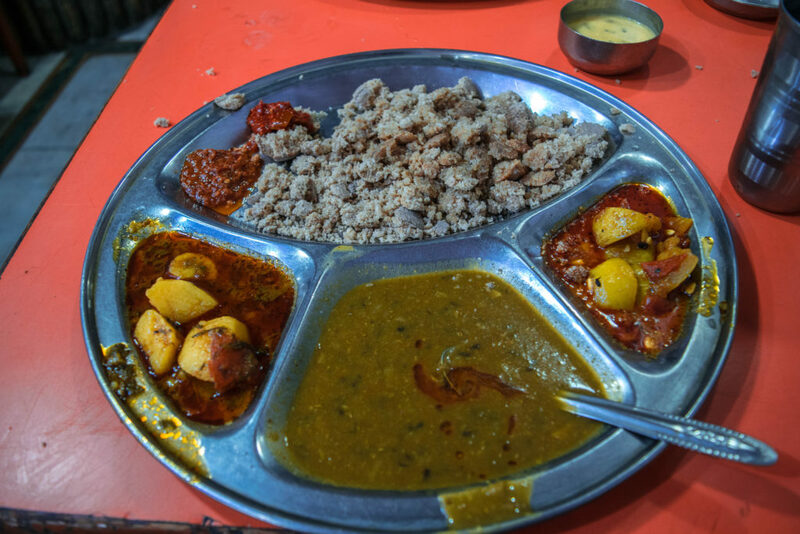 If you want a heavy breakfast, then you can check out one of the local dhabas serving here. You will find them serving Idlis, Kachoris, etc. in the morning. If you want to try the authentic Rajasthani Pyaaz ki Kachori then Rawat Mishthan Bhandar is the best place for you. Their kachoris are truly scrumptious and will make you forget all the kachoris that you have ever had in your life. Also, if you do come here for lunch, don’t order any snacks like Pav Bhaji, Chole Bhature, etc. as you will be ultimately disappointed. Do try the Rajasthani cuisine or the North Indian dishes here. An average meal at this place would cost you around 150 – 200 INR per person. One of the most popular restaurants in Jaipur for eating an authentic Dal Baati Churma is the Dal Baati Churma Restaurant. Personally, I liked their food a lot but I did think it to be slightly expensive. A mini Dal Baati Churma thali consisting of two Baatis and costs about 150 INR here. On the Station Road, there is a small dhaba named Santosh Bhojnalaya where you get good and cheap Rajasthani food. While I wouldn’t recommend the Dal Baati Churma here, the Rajasthani thali is actually quite tasty. And completely worth the money at 100 INR. Frankly, I wouldn’t suggest this place for eating as the food is dry and bland over here. But, you do get to see an amazing view of the Hawa Mahal from here. Since Jaipur City is a popular tourist spot, you won’t find difficulty in finding a cheap and decent stay here. Depending on the season, you might also find accommodation for as low as 35 – 40 INR per night. No, I am not kidding! You can check on Booking.com for this month and next month. There are numerous hostels in Jaipur which offer a decent sleeping arrangement along with some clean bathroom amenities. Ideally, you should get a hostel for 100 – 200 INR per night during busy weekends or peak season. If you visit during offseason or during slow weekends then you might even get a hostel for 50 – 75 INR. I stayed in Tuk Tuk Backpackers hostel which cost me 229 INR for a night in an AC 10-bed dormitory. If you want more privacy then, you can check out a homestay or an Airbnb apartment instead. You will find a good apartment for 600 – 900 INR in a decent location.